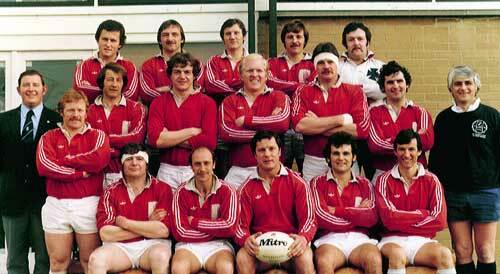 Invitation XV Team at opening of Chambers Park, April 1980. Back Row L to R: M. Finn, H. Campbell, F. Wilson, C. Fisher, I. Johnston. Middle Row; H. Matchett, A. Armstrong, R. Dixon, R. Rankin, D. Dalton, W. Anderson, T. Bowen, A. Sturgeon. Front Row: Desmond McCann, I. Brown, S. McKinney, R. McBride, S, Blake-Knox..